Author Archives: Harry Gamboa Jr.
Harry Gamboa Jr. photographing Roy Martinez, Artist, for Chicano Male Unbonded series. Gamboa’s work has continued in this “social surrealist” vein, driven by a need to distort and magnify the absurdity, chaos, and violence of contemporary urban experience. As in Gamboa’s other work, the Chicano Male Unbonded series rhetorically exaggerates and mocks stereotypical perceptions of ethnic identity as a response to his awareness of the complexities of negotiating and affirming it. The strategy of the photographs is simultaneously to acknowledge and counteract the image of the Chicano male as signifier of urban danger and criminality, as menacing Other. Gamboa poses and photographs his subjects in a way that seems to confirm or heighten such stereotypical connotations. A sense of dangerous confrontation is evoked by a series of theatrical devices: the men stand alone in deserted, dimly lit outdoor urban settings at night; with arms crossed or in their pockets, they look directly and unsmilingly into the camera; a low camera angle endows them with a presence that looms menacingly over us. 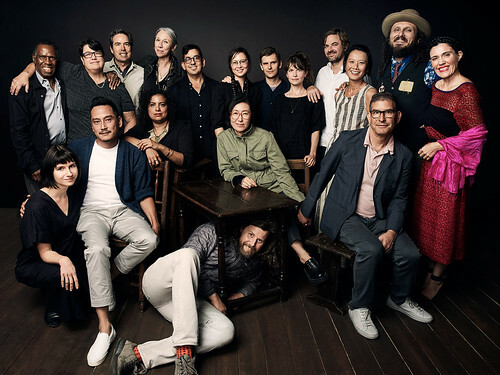 These characters of the urban setting and of self-presentation guide the viewer to reductively read them as signifiers of the character of the photo graphed subjects, as identifying marks of Chicano maleness. This reading is subverted by the titles and captioned biographies of the photographed subjects, who are identified as academics, artists, actors, lawyers and other professionals, pillars of the community not the potential muggers they at first appear to be. Another look discloses quite ordinary dress and unremarkable physiognomies. The idea of “the Chicano male” is displaced finally by a series of individuals who do not exhibit any obvious visible qualities which connects or defines them as “Chicano,” a quality contained by rather than containing them. His subjects, then, are “unbonded” both in our initial sense of them being not yet bonded (that is, criminally dangerously, on the loose, beyond the control of the authorities), and in our final sense of their being freed from such “bonded” images and from the bonding performed by such images.